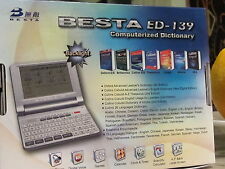 Besta Cd-216 English Chinese Electronic Dictionary Translator. Condition is Used. Shipped with USPS First Class Package. Up for sale is a used translator by Invectec Besta. 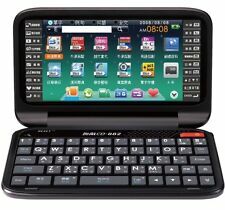 This is a 4.5” LCD digital translator that translates in both directions English and Chinese. No exceptions! (Unless it’s due to our mistake). (Unless it is a mistake of our part or for a defective item). I never used the CDs, but inspected them visually and they are all perfect except for the blue CD (noted in the photo) has a tiny nick and the green CD has the normal very small scratches that usually occurs upon normal usage and wear. 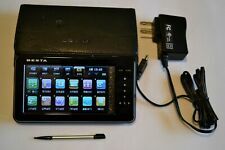 Up for sale it is a handy and useful Besta CD-168 Chinese/English electronic dictionary. This Chinese/English electronic dictionary is being sold as pre-owned and used. This electronic dictionary shows minor blemishes and scratches on all around its surface and unnoticeable to the naked eye. Besta syllable pronunciation, an ideal tool for beginner level English speaking learners. Chinese Idiom Dictionary with approx 15,000 idioms. 4.130,000 human voice example sentence recordings for Eng / Che and Oxford dictionaries. Human Voice Mandarin Pronunciation. English & Chinese Talking Dictionary. Exclusive Pronunciation Correction Function. Over 100 Video Conversation Learning Courses. BESTA NEW CD-37 Chinese/English Translator - Used working condition. - no AC ADAPTER, you simply install a AA battery (batteries not included). Tested working well (see pictures. ). Used In good condition. Comes with stylus and cable, comes with only ONE SD card. Previous owner put plastic jewels on cover as shown. Please review all pictures for details and condition. Item has sound and reacts to stylus. Couldn’t check much due to language barrier. Please purchase with confidence. Manual / Book for Besta CD-65 Chinese To English Talking Electronic Translator Dictionary.Manual is in Chinese. GOOD CONDITION. LOST CORD(REDUCED PRICE). 無敵CD-865 light 彩色電腦辭典. Countries that require an identification number include: Brazil, Chile, China, Ecuador, India, Israel, Peru, Qatar, South Africa, South Korea, Taiwan, and Turkey. 支援字典牛津英漢大辭典, 英漢辭典, 日華華日外來語. Now buy BESTA WN-7, free get 8GB SD Card! BESTA HUMAN VOICE:Chinese Mandarin/English. ( Don't worry about BESTA WN-7 lithium battery life, it use best battery, one battery can use many years). Handwriting input: English / Chinese / Japanese / Korean. BESTA New CD-37 Chinese to English Translator slightly used in leather case. Condition is New. Shipped with USPS First Class Package. BESTA CD-951 English / Chinese Electronic Translator Dictionary. Defective only. – 首款翻譯機加入有聲書功能. – 14國外語辭典輕鬆學，支援中文雙向查詢. – 英語童謠輕快易學，激發英文學習興趣. BESTA CD-951 English / Chinese Electronic Translator Dictionary. or we will send at random. 1 year warranty from Manufacturer. – 【運動英語】提供專業中英解釋. – 牛津英語搭配詞典 、朗文當代高級辭典 、當代英語搭配辭典…. Retrun Policy. BESTA CD-631 CD631 English Chinese Translator Dictionary. Important Note: User's manual provided is in Chinese only. Defective only. – 520萬字庫、20種語言、140本專業辭典. – 英漢、漢英雙向查詢. – 4.3吋螢幕，易拿兼顧螢幕大小. BESTA CD-828 English Chinese Electronic Dictionary Translator. Dead battery. BESTA CD-828 English Chinese Electronic Dictionary Translator. Dead battery. Also doesn't come with a power charger. Condition is Used. Shipped with USPS First Class Package. BESTA NEW CD-37 Chinese/English Translator - AS IS. Unit powers on but unable to test fully because of language barrier. There is a slot for a data card but one isNOT included. Item appears to be in good condition but has not been tested. See photos. Listed for parts or repair. Any item sold by the Seattle Goodwill is eligible for local pick up at our warehouse. Net proceeds from the sale of these goods and financial donations from the community make it possible for us to operate our free job training programs. (It works with defect: 1). Button on the left side(1/3) don't work, you can bypass those key using Pen only 2). BESTA CD-951 English / Chinese Electronic Translator Dictionary. It is not acceptable to send the goods to P.O. BOX. or we will send at random. PCB color and bundled software versions are subject to change without notice. Countries that require an identification number include: Brazil, Chile, China, Ecuador, India, Israel, Peru, Qatar, South Africa, South Korea, Taiwan, and Turkey. We only carry authentic products. Important Note: User's manual provided is in Chinese only. Defective only. – 520萬字庫、20種語言、140本專業辭典. – 英漢、漢英雙向查詢. – 4.3吋螢幕，易拿兼顧螢幕大小. BESTA CD-631 CD631 English Chinese Translator Dictionary. Important Note: User's manual provided is in Chinese only. or we will send at random. – 英語童謠輕快易學，激發英文學習興趣. Retrun Policy. – 【英檢背高分】掌握英檢字彙力. BESTA CD-631 CD631 English Chinese Translator Dictionary. Important Note: User's manual provided is in Chinese only. It is not acceptable to send the goods to P.O. BOX. or we will send at random. PCB color and bundled software versions are subject to change without notice.